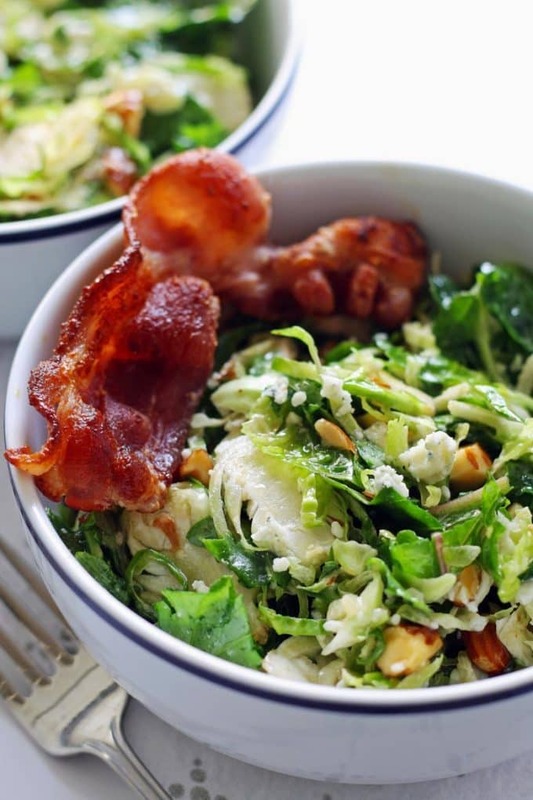 This Brussels sprouts kale salad with bacon, almonds, blue cheese and a lemon garlic vinaigrette is perfect for lunch or a light dinner! This salad has so much (awesomeness) going on that figuring out where to start and what to talk about is leaving me a little…. hungry. Which is really odd since I have been eating lots and lots of this salad. It’s my new favorite fo’ realz. Let’s start with the kale. So… I have never had a kale recipe here on the blog until now. I don’t know if you realized that little fact but there is a very good reason. I have an autoimmune disease and while it is totally under control now, there was a year or so when it wasn’t. I became fascinated with the autotimmune protocol/paleo diet in the hopes of feeling like a normal, well person. I never followed the AIP diet, but I read a lot about it. How I wouldn’t be able to eat some of my favorite things like everything in the nightshade family. Goodbye peppers, hot sauce and tomatoes. Also, no cocktails… goodbye happy hour. I couldn’t get myself to say farewell to any of those things but I found one ingredient on the non-exclusion list that I wasn’t upset about giving up. Kale. So, I read all of that information and studied the AIP diet and then followed none of it. And gave up kale, which I should have been eating more of. I make no sense, obviously. Sitting on this computer, working all of the time, has made me sedentary and my clothes aren’t fitting as well as they once did… even my yoga pants. Something’s gotta give … and it’s me. 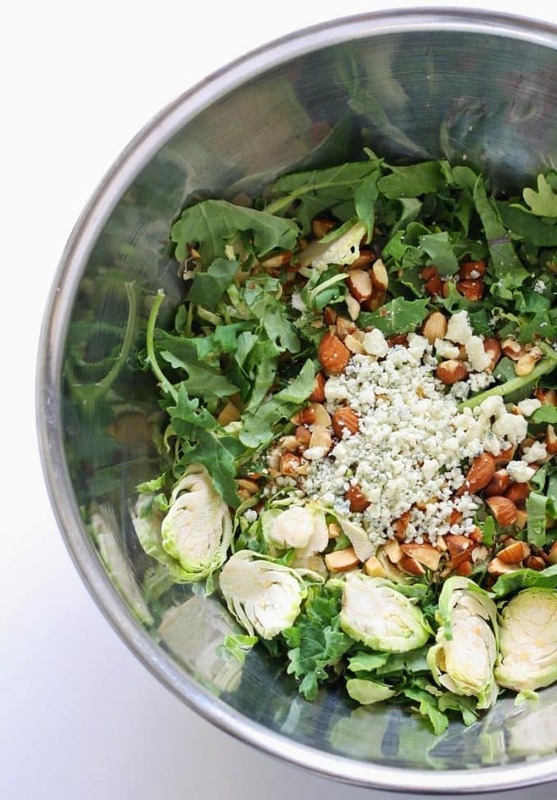 Working out and eating more salads like this brussels sprouts kale salad have been added to the top of my daily to-do list. Yes, I know this salad has both bacon and cheese in it. A girl can’t change completely in one blog post. At Tar-get (pronounce that like its French please), I found a very awesome bag of shaved brussels sprouts. Normally, I would shave them myself but I felt like saving a little time (birthday weekend and all). I’m not quite ready to share my own video tutorials so I found one for shaving brussels sprouts on YouTube for you, if you need help figuring out where to start. You’re welcome. I chopped up the kale so it was similarly sized to the b-sprouts – I find myself more likely to finish salads if everything is around the same size. And I chopped up the almonds pretty small too. So, I guess this is kind of a chopped salad but I’m going to just keep calling it a brussels sprouts kale salad. 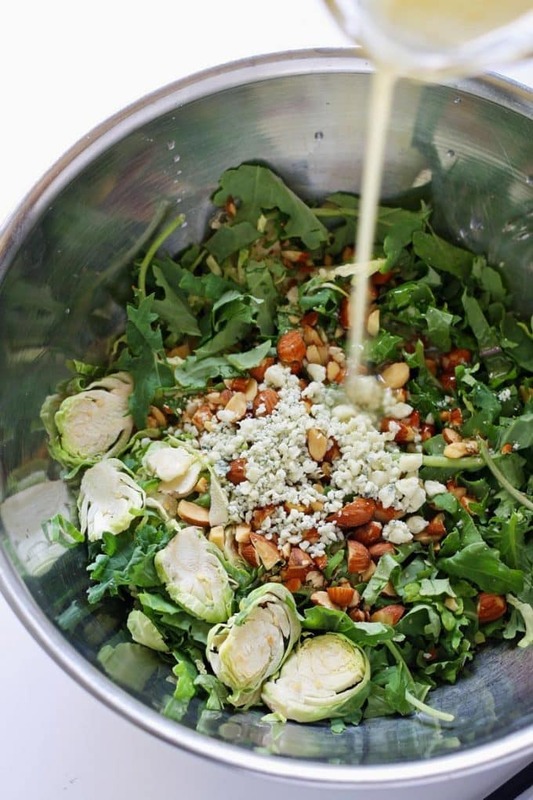 Mix all of the salad ingredients together and THEN add the salad dressing. 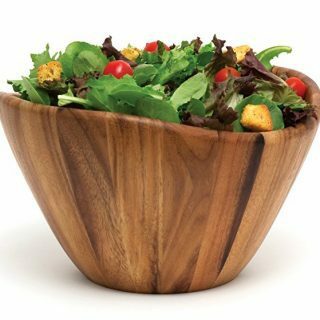 Looking for more savory salad recipes? Try this savory cantaloupe salad or this baby arugula tomato salad! 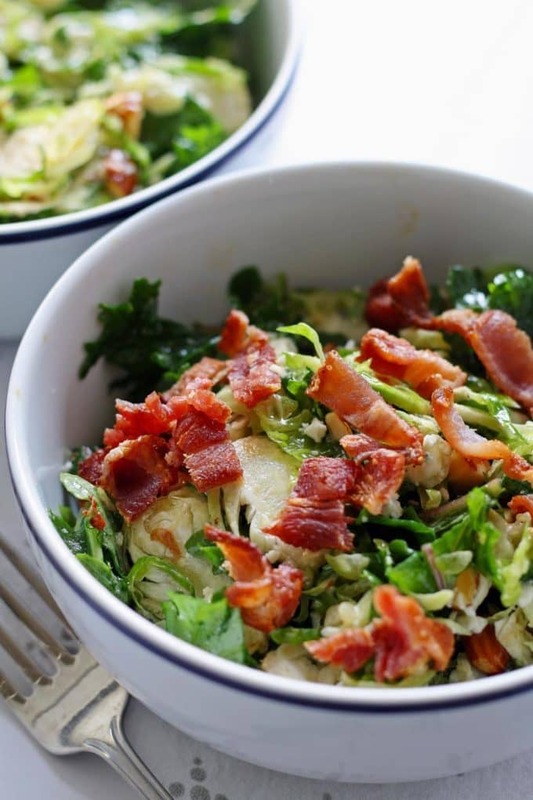 Looking for more Brussels sprouts recipes? Try these roasted Brussels sprouts or these roasted Brussels sprouts with grapes and walnuts. Brussels sprouts kale salad with bacon, almonds, blue cheese and a lemon garlic vinaigrette. Perfect for lunch! 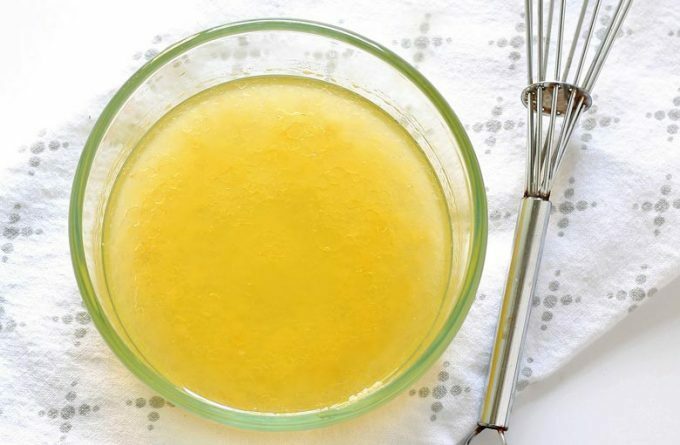 In a small bowl, whisk all of the salad dressing ingredients together until well combined. This salad looks amazing– all my faves!! This looks like my kind of salad. BACON!! I love that you used Brussels sprouts too! I absolutely love every part of this salad! I’m definitely going to have to try this out… and like you our pants are getting tighter and we have to eat more Salads! I cracked up when you pronounced Tar-get in true french style because my sister and I do that ALOT! 😀 hahaha! Oh wow, that salad looks amazing! Pinned! Thank you for sharing at Merry Monday! I love brussels sprouts in salads. This is such a great idea to add them with kale and the blue cheese. 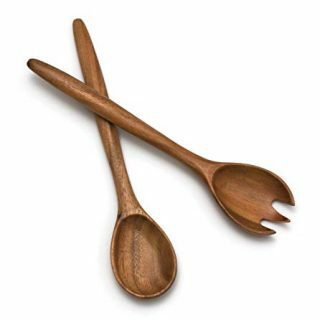 I bet apples would go great with this too. Looks fabulous! I will definitely be trying it with apples the next time I make – thanks for the suggestion! OMG I may have just drooled! 🙂 Yummy! 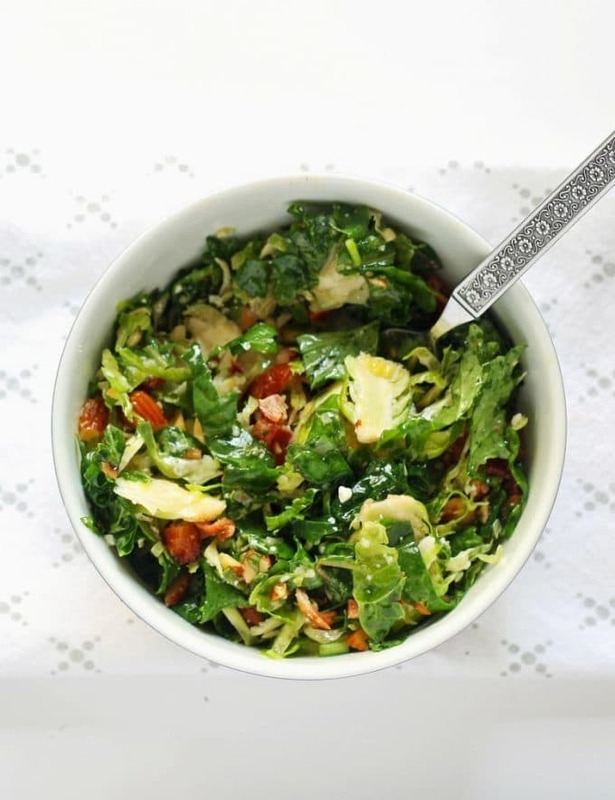 I love Brussels sprouts and kale, this salad sounds so good! Thanks for sharing at What’d You Do This Weekend?! I need to add this to the menu this week! Thanks for linking up with What’s Cookin’ Wednesday! I am glad that we don’t have a Tar-jeh near me because I would be in there all the time! And I would be broke:( Going Paleo has me eating more salads just so I can fit into my workout clothes again. How sad is that! I am excited about this salad. 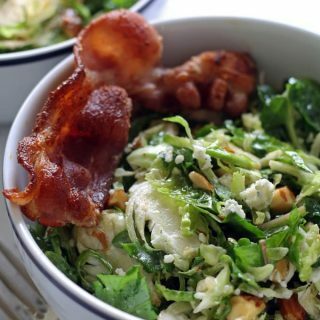 Love sprouts and I can use that piece of bacon as a shovel to get it in my mouth faster:) Thanks for linking to Saucy Saturdays! I tried Paleo for a little bit too but it’s just too restrictive (and I have such a sweet tooth!